How did a Polynesian, Mormon football player end up at a Catholic University and cause a national commotion like Manti Te’O has managed to create? We’ve heard the story, a player garners sympathy from Heisman Trophy committee members by creating a gut-wrenching tale of tragic proportions in order to win the coveted prize. The scandal has most likely ended his chances at the award, but the question still remains unanswered: why would such a gifted student-athlete fabricate such nonsense and be as gullible as he was? It’s simply attributable to nothing more than his LDS upbringing. It’s highly likely the cause is nothing more than the epistemology of Mormonism which has been proven categorically false. You seldom associate people of Polynesian descent with a faith that has a sordid history of labeling anyone of color as “cursed.” Many are unaware, in addition to BYU in Provo, Utah, there are other tentacles extending from this consummate headquarters of Mormon treachery. There is also BYU Idaho and BYU Jerusalem. The Polynesian connection is evidenced by the founding of a Hawaiian version of the Brigham Young (a.k.a. Bring’em Young) University, BYU Hawaii. In order to extend their reach both ethnically and geographically, LDS Missionaries conquered the future American Island region early on and managed to convert enough Lamanites to make a substantial addition to the LDS worldwide tithing base. As an added bonus, the area is rich with mega-talented football players who are often Mormon, so BYU is generally highly competitive with the help of these players of Polynesian origin. 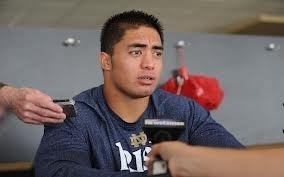 Manti said his decision to go to Notre Dame, instead of BYU (Utah) came from prayer and introspection. I also suppose the decision not to serve his mission was something he prayed to decide? I’m absolutely certain NFL money wasn’t paramount to the prospect of teaching Third-Worlders the tall tales of Joseph Smith. He is not the first to forego his mission. There is a big force in Mormon culture for all young men to serve a two year mission. As of late it seems the culture has given exceptions to this rule for athletes. Steve Young, Danny Ainge, Jimmer Ferdette and Manti Te’o did not serve missions. The Mormon culture will label their work and spotlight on the field/court as missionary work because they will bring positive attention to the church. And for Mormons this is the perfect marriage. That essentially confirms the purpose of a Mormon Mission: to sign more people up and amass more wealth for this Fortune 500 Corporation, LDS Inc.
Park Romney, author of “The Apostasy of a High Priest” offered his opinion on the Manti Te’O scandal as it relates to LDS culture and upbringing (known by Mormons as lying for The Lord). “The underlying culture and philosophy of Mormonism encourages the mentality that results in this type of behavior, even while ostensibly discouraging it. This is accomplished in ways that are understood by students of epistemology”. It’s as simple as this. If you can fall for the teachings and machinations of the Mormon Church, you may believe anything you see and hear on the Internet. After all, you’ve been desensitized to believing half-truths and outright lies without question. Faith is often man’s biggest liability, not a desirable asset. Hearing the term, he/she is a person of faith has the opposite effect on me as it might on so many in this country. In my humble opinion, it is a trait one shouldn’t brag about or advertise. If you can believe unsubstantiated fiction is fact, you probably can believe anything. Unfortunately, football and most other aspects of our supposedly secular society are inundated with the credo that praying to a “Heavenly Father” is the right thing to do. It will be quite some time until we evolve as a society where this nonsense is no longer heard, but I’m not holding my breath. For more insight, check out Park Romney’s website for a wealth of information on current events, epistemology of many faiths and great resource listings. If you’re interested in electric vehicles and sustainable energy, or would enjoy great tweets, follow Mark Larsen here. The invocation of Ronald Reagan’s legacy is a tactic utilized by the Right to more or less humanize their devastating Draconian cuts to basic health and human services, including mental healthcare. This is quite astonishing as Reagan was, perhaps, the most inhumane leader with regards to caring for the least among us and those with legitimate mental health issues. The party of Jesus, (GOP) as we all know, acts quite contrary to his teachings. Monies are always cut in mental healthcare (ESPECIALLY FOR WAR VETERANS) and redirected to fund more private, for-profit prisons instead of properly helping those in need. The unfortunate consequence of defunding such programs have a dire impact on the afflicted and their families. The lack of stable housing and work will certainly exacerbate and create depression and mental illness, substance abuse, family break-up, and crime. •In 1978, HUD’s budget was over $83 billion. •In 1983, HUD’s budget was only $18 billion. •In 1983, general public emergency shelters began opening in cities nationwide. •In 1987, Congress passed the Stewart B. McKinney Act, providing $880 million in homeless assistance funding (2004 constant dollars). •In short, Reagan deliberately created “homelessness” by cutting $65 billion of housing money and replacing it with $880 million in shelter funding. The lost funding has never been replaced, and the percentage of low-cost/subsidized housing has been dropping ever since. 100,000 units of low-cost housing have been lost since 1996 alone. 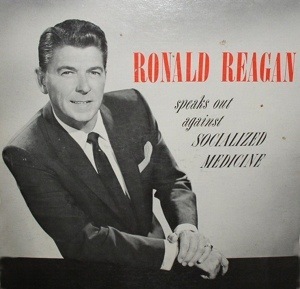 When Reagan defunded mental health care and threw the mentally ill onto the streets, he was saying it was not his problem and the American people went along as he de-railed what was an improving situation for those with mental health issues. Now, more than thirty years hence (and countless massacres by those possibly afflicted with mental illness), the GOP/NRA is suddenly saddled with immense concern for the mental well-being of Americans. The NRA and most of the GOP is obsessed with trying to minimize all the devastation caused by military-style, high ammunition-capacity firearms. They pervertedly believe this problem will be alleviated by fewer restrictions on guns, and accessories which facilitate mass killings. Add this to their shameful history of defunding, defrauding and devastating mental healthcare and we can predict exactly what they’ll do for those needing psychological care and protecting the innocent: absolutely NOTHING. Another issue the pharmacy-subsidizing GOP (and often Democrats too) won’t address is the over-medication of our children for behavior issues. The pharmaceutical industry has profited immensely from these psychostimulants readily prescribed for ADD and ADHD diagnoses. Without long-term study and the lack of reporting on the matter, we don’t know how adversely they will impact brain chemistry into adulthood. Maybe it’s not video games or movies that cause these unfathomably egregious acts of violence. Maybe it’s because, according to the United Nations, the U.S. produces and consumes about 85 percent of the world’s methylphenidate (Ritalin). Also commonly prescribed, SSRIs (Selective serotonin re-uptake inhibitors or serotonin-specific re-uptake inhibitor) are a class of medications which have been shown to be a commonality among those who commit violent acts in schools. People who have used these medications might not be the best candidates for ordering a personal arsenal of military-grade weapons and ammo. Perhaps the NRA’s definition of someone who should pass a background check needs some work. As proposed by our President, maybe no one should own weapons the military uses which are specifically designed not just to kill, but to obliterate other human beings en masse. Studies with regards to mental health issues and guns must include the socioeconomic factors of poverty, the insanely unfair for-profit prison system and the highly subsidized pharmaceutical industry that receives an obscene amount of corporate welfare. Restrictions and regulations are the enemies of Republicans, as they firmly believe both impinge on capitalism and “job-creation.” Since this tenuous concern of the GOP is so very obvious both historically and currently in the areas of mental healthcare matters, shouldn’t they be omitted from the decision-making process? As one who firmly believes history repeats itself when the lessons are not learned from the past, I believe the GOP/NRA-ILA is the last group who should debate and legislate this matter. We all know how anti-education they’ve proven themselves to be as they have embarrassingly omitted unpleasant facts and re-written history in our children’s textbooks. They’ll do the same thing to our mentally impaired citizens as they did to the Iraqi people: attack and destroy them simply because they have the power to do so. 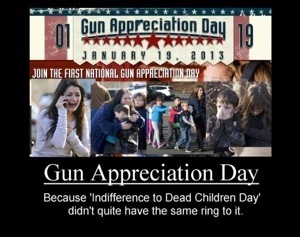 In order to completely disrespect every family who is currently grieving over the loss of a family member, (a child in particular) to gun violence, the Council on Promoting Gun Violence and Exploiting the Dead (my embellishment) has decided, in their infinite paranoia, to declare Saturday, January 19th “Gun Appreciation Day.” to be ironic, these fine folks chose the very weekend we celebrate the birth of a champion of non-violence, MLK. These people, who clearly pervert the Second Amendment, must make certain if any crazed, violent loon has the inclination, he or she has access to as much ammunition and high-powered weaponry as they so desire. The number of people in America killed by firearms is extraordinary compared to other nations. If we’re not a bloodthirsty culture, as wars seldom reach our shores, we need to look at everything we can do to safeguard our people. 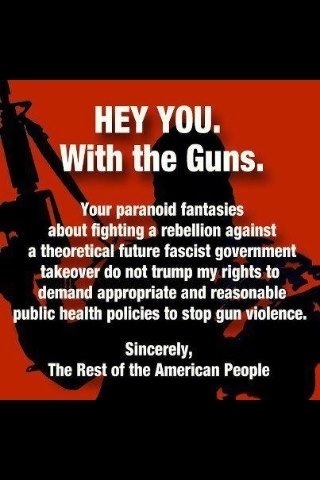 These gun rights rather than human rights advocates clearly have a violent, profit-driven agenda in mind. Prominent leaders’ assassinations have been the catalyst for legislative action via public outrage in our past. 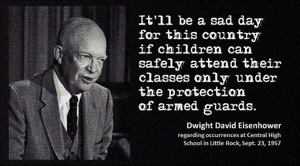 The 1960’s were a volatile time where we lost some of America’s greatest leaders to senseless gun violence. Martin Luther King was fatally shot by sniper’s bullet on April 4, 1968. Death was the result of a horrific gunshot wound (to the chin and neck with a fatal transection of the lower cervical and upper thoracic spinal cord and other structures in the neck), a violent end to a life of noble purpose. Just two months later, RFK was also taken out by an assassin with a gun. The nation’s hopes and dreams for peace died right along with him. The Johnson Administration passed new gun control measures, reasonable means to minimize tragic shootings, without denying Second Amendment “rights.” Johnson’s bill banned all mail-order and out-of-state sales of handguns, shotguns and rifles; prohibited the sale of guns to minors; and required national registration of all guns and licensing of all gun owners. No reasonable citizen could argue these measures were, and still are, very logical. Unfortunately reason, logic and mental health are sadly lacking from so many who pervert the second amendment to mean they should own as many military-style automatic weapons as they can fit in their closets next to their Confederate memorabilia and Hank Williams Jr. concert shirts. Johnson’s words were as apropos then as they are today. Somehow reason prevailed and we were able to pass some common sense safety measures. During Vietnam War protests, outrageous gun violence was an issue compromised mainly of police brutality. The incident at Kent State, May 4, 1970 focused our gun injustices on our police and authorities’ lack of restraint. The number of massacres at the hands of police, however, pales in comparison to the carnage of all the mass shootings we’ve experienced in the last twenty years. The gun lobbyists claim violent video games, lack of prayer and lack of universal gun ownership are more to blame than the easy acquisition of high-powered firearms which they proliferate at thousands of gun shows . The NRA has immense political power, and associates themselves with unsavory, paranoid lunatics like Alex Jones and the Chairman of National Gun Appreciation Day, Larry Ward. Their type of manufactured dystopian hysteria creates a culture more concerned with contrived future scenarios than the problem of constant gun massacres. This is evidenced by comparisons of President Obama to Chairman Mao, Stalin and Hitler. Generally, once Hitler is used as a reference, proponents of such absurdity have lost their argument and their minds. There is utter disbelief expressed by ALL wealthy, industrialized nations looking upon us in horror at this manageable problem. We wanted fewer deaths from drunk driving, and voila, in just thirty years we’ve lowered fatalities by 50% with movements such as M.A.D.D. We raised the legal drinking age and sure enough, death rates fell. Since so many of these crimes are perpetrated by people in their twenties, maybe closely scrutinizing gun ownership by this demographic would be a great way to start. With the recent unfathomable carnage of Newtown and Aurora, I’m hopeful the level of outrage has reached a tipping point. A recent Newtown visit by Gabby Giffords and husband, Mark Kelly has, once again, exposed the fringe element in the NRA-owned GOP. 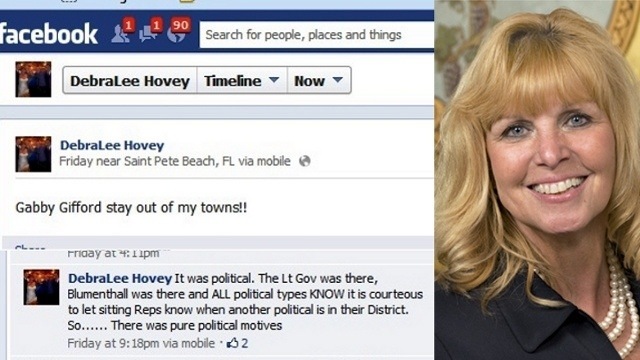 The Facebook exchange below shows just how convoluted their thinking has become. You can’t engage a cross-section of your acquaintances without running into one or two quintessential “Obama is coming for our guns” morons. If we lessen the exposure and power of these paranoid miscreants, we may be able to make assault rifles and the proliferation of arsenals by the deranged as unfashionable as the Jim Crow South. The only way we’ve successfully conquered opposing forces clinging to outdated and inhumane policies is by collectively expressing our desire for change and forcing legislators to LEGISLATE SANITY! There is a false perception in America that there are more gun owners than there actually are. The number of households owning guns has declined from almost 50% in 1973 to just over 32% in 2010. This misconception that most Americans are proud gun owners just isn’t true. It has helped bolster a political narrative, emboldened the National Rifle Association and left politicians worried about losing elections if they try to do any of the following with regards to guns: increase regulation, increase taxes, restrict sales, legislate in favor of safety and sensibility or ban any particular type of deadly firearm or accessory. 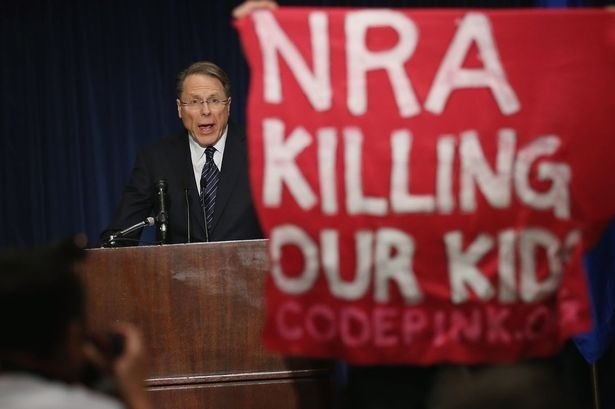 The NRA, whose affiliated organizations include the Institute for Legislative Action, the NRA’s lobbying arm, and the NRA Foundation, a 501(c)(3) tax-exempt organization, which provides “a means to raise millions of dollars to fund gun safety and educational projects of benefit to the general public.” Like this group, religious institutes, namely the LDS Cult, enjoy untold savings from their tax-exempt status. So why not partner up and make it doubly tax-free? I’ve tried to steer clear of dissecting the Mormon political, social and economic culture since the defeat of Willard Romney, but I can’t seem to shake the connection between matters that are egregiously wrong with our society and that cult. Researching the history of the NRA’s rise to power pointed me in an unexpected direction. 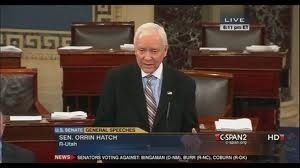 The perpetrator of this lobbying travesty is none other than Senator Orrin Hatch (R-Ut). Today, the NRA had the audacity to say Congress is “jumping on every tragedy to ban guns.” Not this Senator, he’s been a champion of “gun rights” rather than championing the rights of innocent people to live life without the threat of dying by the hand of a gun-crazed lunatic. “There were really two goals, I suppose. First, we wanted a definitive account of the history of the Second Amendment and the right to bear arms. For decades – maybe even longer – people had tried to pretend that the Second Amendment was somehow ambiguous, (they did?) that the intent of the Framers, when it comes to this one amendment, was simply unknowable. Of course, it should be noted that most of the people making this argument tended to believe that the meaning of the entire Constitution changes over time. But, with the Second Amendment, they’d been more than willing to simply read it out of the Constitution entirely. Our second goal with the report was to change the dialogue on gun rights. Instead of arguing how far the government could go to keep people from buying guns, we wanted to get people thinking about doing more to facilitate lawful, reasonable gun ownership. I think we were successful on that count as well, though it took a number of years for the debate to be where it is now…..Even into the 1990s, it was fashionable for Democrats to demonize guns and gun owners on all sides. Guns became a scapegoat – and, by extension, those of us who supported the rights of gun owners were also scapegoats. Leading the charge for the poor, persecuted gun owners is the same man who, earlier in his life, served as a missionary for the LDS Church in the Great Lakes region, and later as a bishop, presiding over a congregation of 600 people. By simply wanting to stop the sale of weapons American Generals say are inappropriate for civilian use, those who grotesquely pervert the Second Amendment act as if taking their lethal toys means we are decimating a sacred document, which actually says no such thing. Utah, with it’s largely LDS population, seems to have a fondness for arsenal procurement. I’ve previously noted Utah seems to be the epicenter of gun vigilantism, as there is incredible profit in the gun business and Utah has the 2nd most guns per capita in the nation. Obviously, 2nd Amendment misinterpreters share a commonality: they feel their possession of entertaining weaponry (which makes them feel more masculine) supersedes innocent life preservation. Utah is leading the charge to arm its citizens. A town proposed mandatory gun ownership for every household in a Utah city. They’ve also topped the list of crazy ideas gone mainstream by trying to arm every single teacher. This is how they respond to Sandy Hook! The National Rifle Association countered with “arm the teachers.” Gun clubs claim hundreds of teachers are applying for free weapons training. Two hundred people showed up for a class in West Valley City, Utah, outside Salt Lake City, on December 27, 2012, for example. Not all of the people who took the course were teachers. But some were, including Carolyn Cain, who teaches special education kids in kindergarten to the 6th grade in Utah County, Utah. Utah County is home to the headquarters, ironically, of the Crossroads Gun Show. How fortuitous for their bottom line! The LDS Church and the NRA are both profit driven groups, which I’ve certainly ascertained during the presidential campaign. Both are predominantly Republican. Both seem to care little for the poor and defenseless of society. Both facilitate murder and pay not one cent to promulgate their violent agenda.